SAN DIEGO — It wasn’t Charles “Chuck” Darragh’s plan to stand out from other boat owners when he set out to build a steamboat. 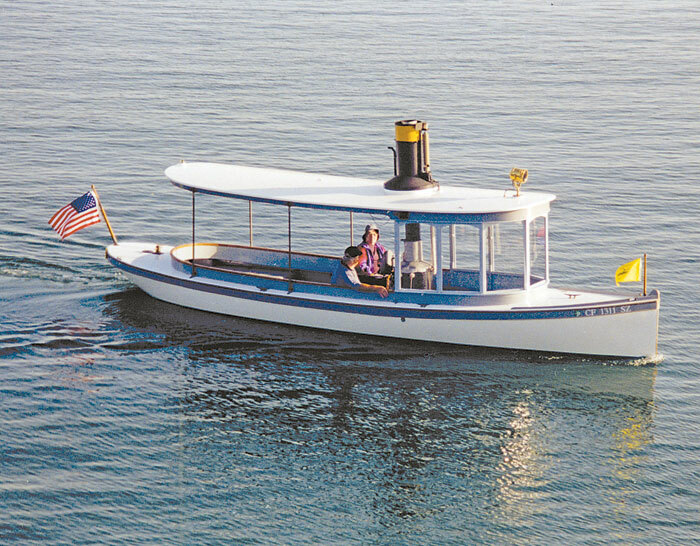 But his unique vessel quickly became a local attraction — and there’s nothing quite like it on San Diego Bay. San Diegans may have caught Darragh cruising around the bay on his steamboat, Amity, as he takes the vessel out on weekly runs. With its black stack and bellowing whistle, the 28-foot steam launch has become a favorite of locals and visitors alike. Darragh, who spent much of his childhood sailing on small lakes and sailboats back home in Amity, Pennsylvania, had become fascinated by steamboats throughout the years. He had always planned to someday construct his own vessel when he could spend time working on it. Darragh constructed Amity in 1995, after he retired as a mechanical engineer. The Midwest native worked on the boat in his boat shed for 3.5 years. He purchased the boat’s balsa-cored fiberglass hull from Bud Leutza in Santa Cruz and Semple Engine Co. built the engine and boiler in 1981. “I spent quite a few hours in that boat shed,” he recalled. In addition to its unique steam propulsion system, the boat features a plumb stem, fantail stern and a canopy to shield passengers from the sun. Darragh has built other wooden boats, but this will be his last, he said. The boat was moved from Darragh’s boat shed to Sun Harbor Marina, where it was launched in December 1998. Darragh took Amity on its maiden voyage in February 1999. Amity was later moved to Southwestern Yacht Club — and the steamboat has been going strong ever since. To date, Amity has averaged 55 days steaming per year for 14 years. It is estimated to have run 2,233 hours — at an average speed of 4 knots. Darragh estimates the vessel has traveled 10,278 miles — or one-third of the way around the world. Many of those miles were racked up while steaming guests and family members throughout the bay. Amity has volunteered time at Maritime Museum of San Diego, and at yacht club special events and cruises. Amity has welcomed guests aboard during Silver Gate Yacht Club’s special events and has the important task of delivering Santa Claus to the Southwestern YC docks during the annual holiday celebration. For the past several years, Darragh has decorated Amity with twinkling lights and he mounted a giant-size Snoopy on the steamboat’s roof and Rudolph the Red-nosed Reindeer on the boat’s bow. Southwestern YC Commodore Chris O’Brien said the spectacle of Amity steaming toward the junior docks, all decorated, with Santa aboard, is one of the club’s most memorable moments each year. One major event that Amity is always a part of is the annual San Diego Wooden Boat Show, where the vessel is on display for all to see. Darragh has steamed guests around Shelter Island Yacht Basin for 20-minute rides for the past 14 years, and he provides a short talk on how the boat works. He estimates that he ferried 445 people on 37 rides during this year’s June 15-16 event. “It’s great fun,” he said. “I take them out, and then we come back — and they line back up again. Although Darragh did not intend for his vessel to become a local attraction when he set out to build it all those years ago, he has gotten used to the attention that Amity has garnered in San Diego. Beam: 6 ft., 6 in. Draft: 2 ft., 6 in.